I was on Prince Edward Island recently for work. Shortly before I left Manitoba, I mentioned to Chris Mears and Taylor Main that I was headed for the island, and they invited me to join them for the Half Nuts operations group on Sunday evening. 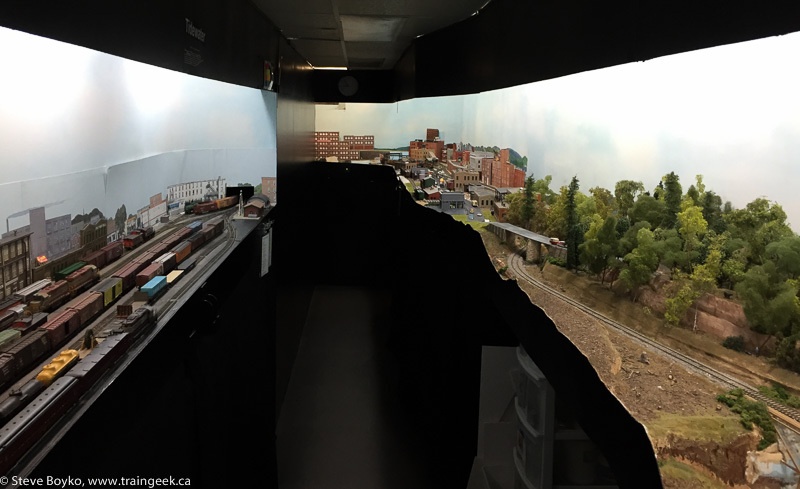 They meet regularly and operate on one of two layouts in the Summerside area. I was pleased to accept the invitation and I met them in Charlottetown for a carpool to Summerside to visit Scott Jay’s Bayside & Tidewater Railway. 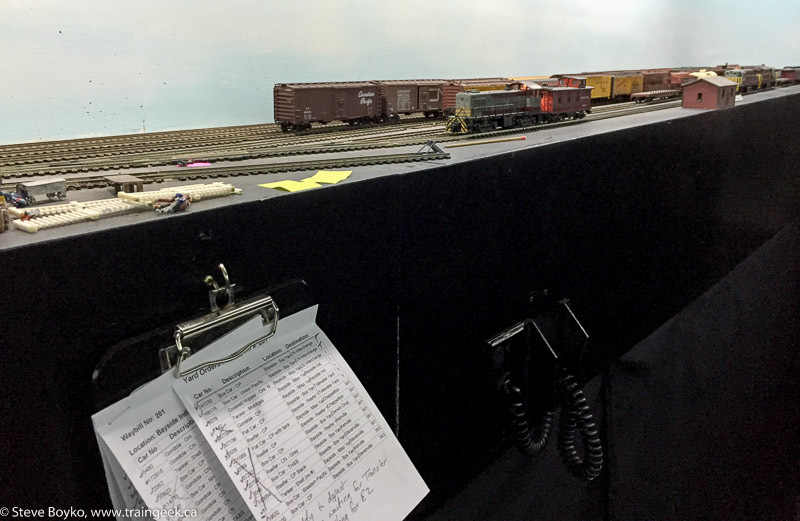 In their last operations session they had some issues with the wireless control system, so the layout was halfway through an operating session. Because of that, this session would be shorter than usual. I met Scott and he introduced me to the other Half Nuts present… more than half a dozen! I wish I was better with names but I did meet Trevor Delaney, and Scott of course. Scott assigned roles to everyone on the railway. He asked me if I would like to operate or to observe. I said I’d love to operate, so he assigned me to the Bayside yard. 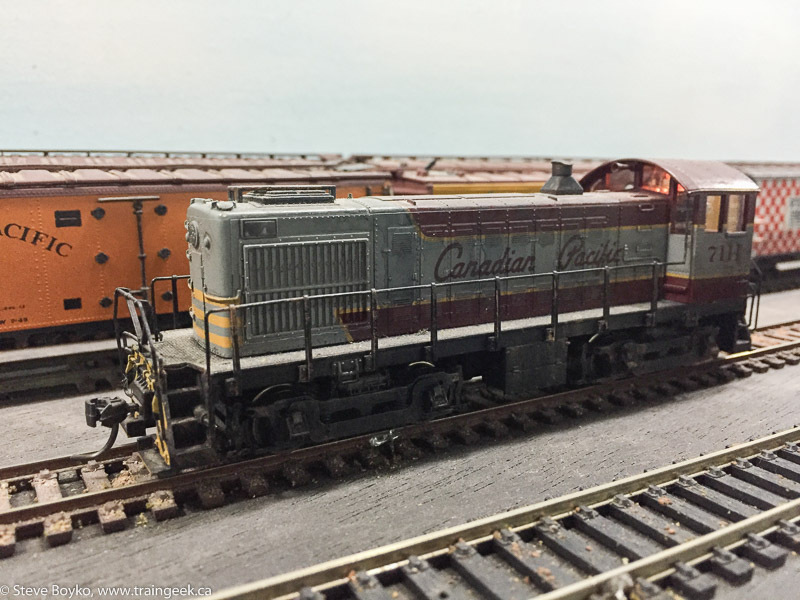 For switching power I had switcher CP 7111, equipped with DCC and sound. Scott uses the WiThrottle app to wirelessly control the layout. There’s an app to install on your phone (iPhone or Android) and then you use the app to connect to the appropriate locomotive (or consist) and drive the train using your phone! It worked very well and it didn’t take long for me to get used to it. The first wayfreight arrived from Tidewater, and after they cut off the power, I began sorting the freight cars. 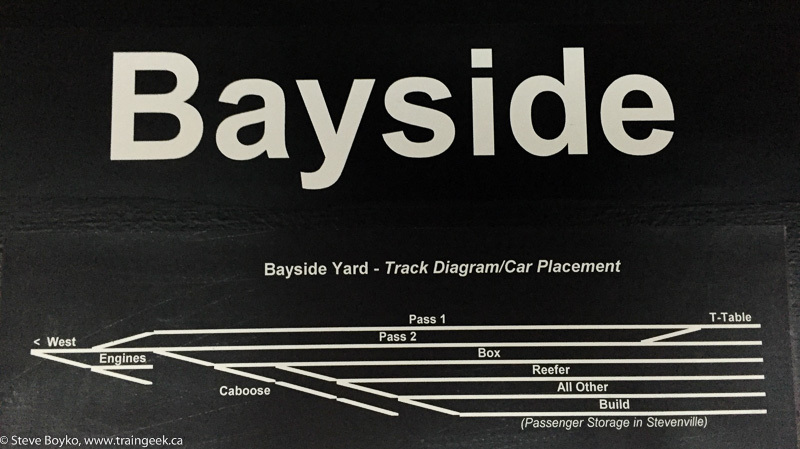 Since there is no actual track after Bayside, the cars are sorted into one of three tracks: boxcars, reefers, and “other”. CP 7111 drilled the yard, putting cars into the appropriate tracks and picking out the few cars that were going onto the US-bound train. I also stuck the power for the US-bound train onto the train to get it completely ready. Only a few minutes after I finished that, the US train operator showed up and took the train away. 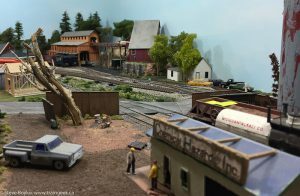 At this point I had nothing to do until the second wayfreight showed up, so I took a walk around the layout to see what other people were doing. CP 8407 and another loco were working in Stevenville. This area has a lot of switching action. There was a lot of action at the Tidewater yard as well. Scott has made the most of the room to incorporate two yards as well as a couple of significant towns. You can see his full track plan here. 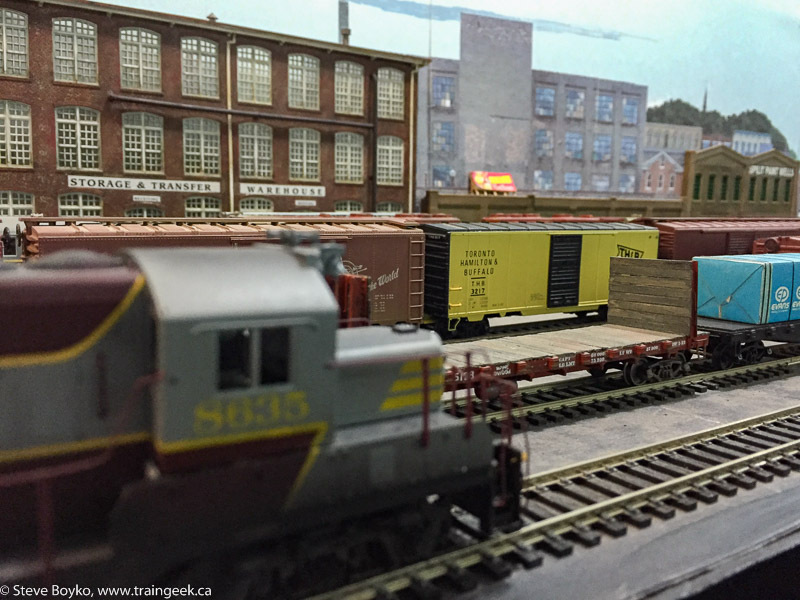 Scott has used a lot of backdrop buildings to add industrial switching areas and use the most of the space. I was mentally taking notes for my own layout! 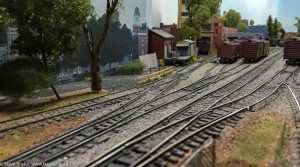 Here’s a view of one end of the layout, with Tidewater on the left and Chappellton on the far right. Chappellton was my favourite area, with lots of switching possibilities as well as a rail car ferry to work. Anyway, back to work. The second wayfreight arrived in Bayside so I had to put its cars away as well. 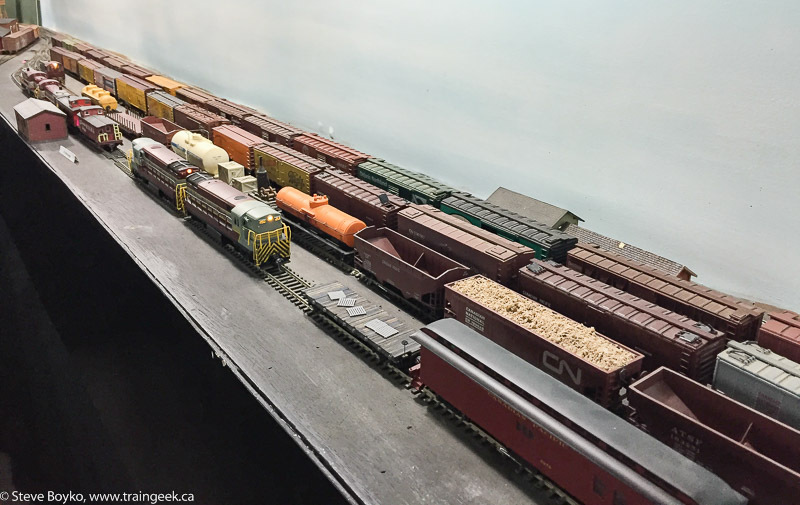 It was a tight fit putting that last boxcar in its track but it did fit. 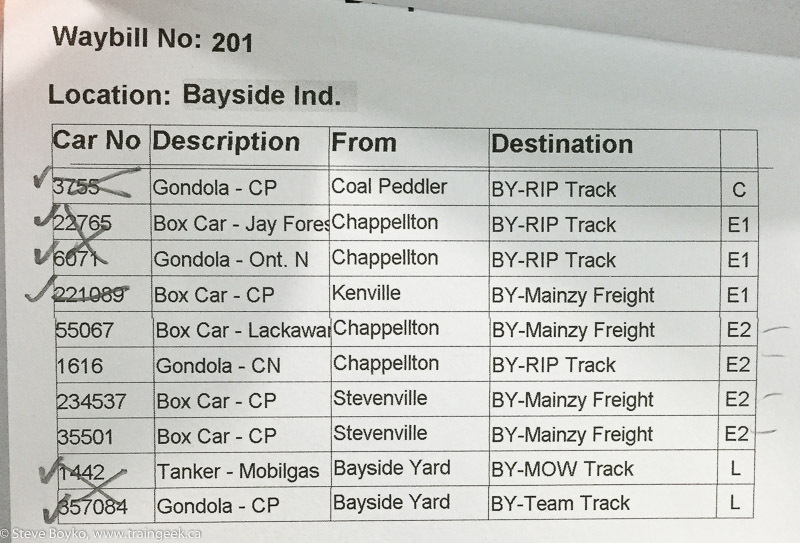 Scott has a custom program developed to route his cars and it produces paperwork like this. The crossed out cars were already dealt with before I arrived. The far right column indicates what train is to carry it (E1 and E2 are the wayfreights). After I put the second wayfreight away, I had to deliver the Mainzy cars to the nearby industries. It was a fairly simple job to deliver them and then put the switcher to bed. You can see how the boxcar track was chock full. It was a real pleasure to operate on Scott’s railway. Everything ran very well, the emphasis was on operation (my favourite) and the layout is nicely laid out and provides a lot of operational interest. 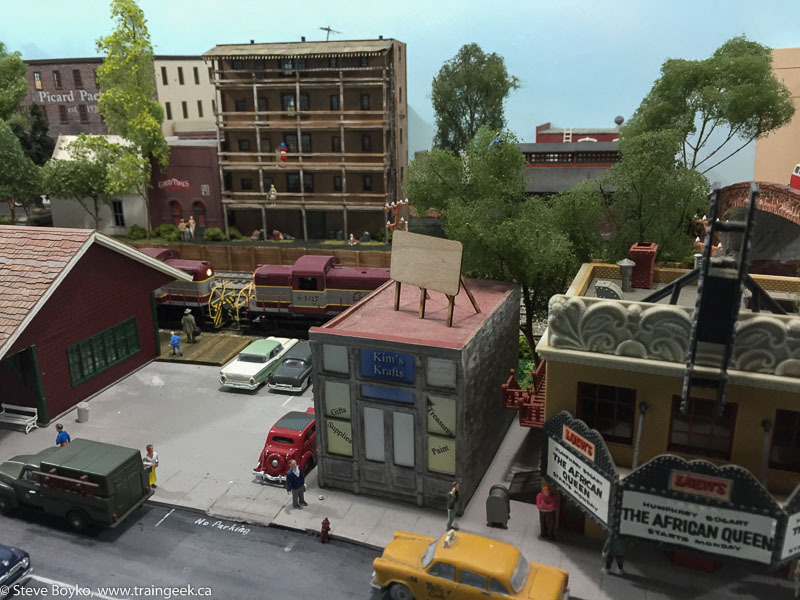 Most of the layout has scenery with only a few bare spots where track revisions are being made / remade. Thanks to Scott for being such a gracious host and letting this transplanted Maritimer operate out east for a bit. 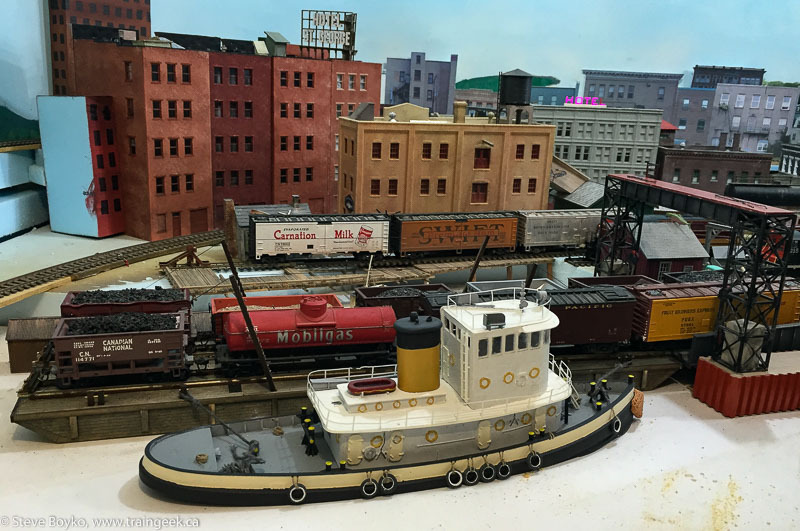 Visit Scott’s web site to learn more about his layout.